What can I do to Keep Invasive Species Out? If you like to boat or paddle, you’ve probably heard the phrase Clean, Drain, Dry. These are the three simple and effective steps you can take to prevent aquatic invasives from spreading from one body of water to another. In fact, these steps are so important that New York State now requires boaters to take “reasonable precaution” before launching anywhere in the state. 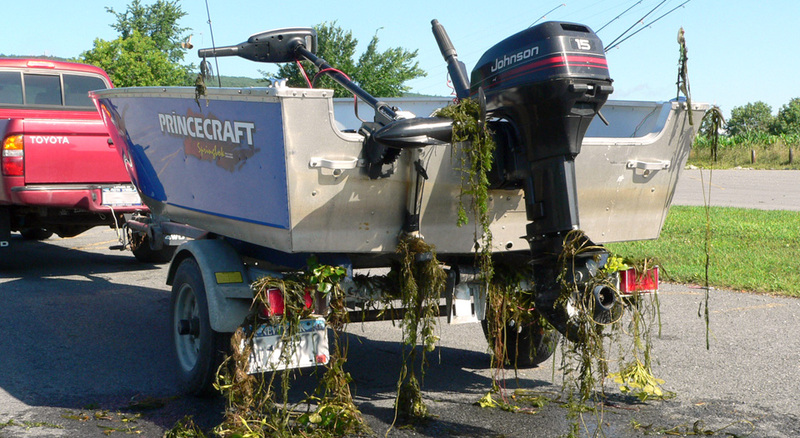 Aquatic invasive species, from Eurasian watermilfoil to zebra mussels, can attach to and hitchhike on boats, motors, trailers and paddles. They can also be transported in bilge and ballast water, live wells and bait buckets. Clean – After each trip, inspect your boat, trailer and anything else that came in contact with water (buoys, anchors, ropes, etc.) for attached mud, plants and debris. Remove and dispose of anything found. Drain – Identify any standing water in boat compartments, bilge tanks, motors or live wells and drain the water from them. Dry – Let your gear and equipment dry completely for at least 48 hours, but ideally five days, before your next trip. For canoes and kayaks, you can also towel dry. One of the quickest ways to ensure your boat and equipment are Clean, Drained, & Dry is to stop by one of the free boat wash stations in the Adirondacks. You can find the nearest wash station at adkcleanboats.com. There are also stewards located at many of the popular boat launches throughout the Adirondacks who will be happy to assist you with inspecting, cleaning and draining your boat. You can do even more to protect your favorite Adirondack lake or river by learning to identify and report invasive species.